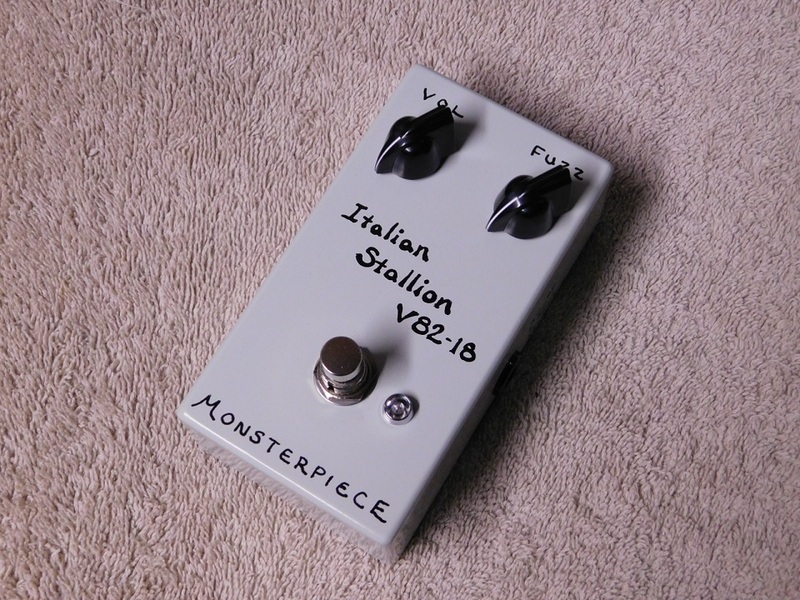 The Monsterpiece Italian Stallion V82-18 Fuzz is my take on the classic 1960’s Italian made vox v828 tonebender. This is a 2 transistor Germanium fuzz in which I using SFT352 and/or SFT353 pnp transistors that are hand selected for proper gain & leakage for best sound in each pedal. The only modification I have made to the original design is an internal transistor bias trim pot that allows you to fine tune the overall fuzz voice to what you hear in your head. This circuit is very similar to the fuzz face circuit, but offers a much brighter tone that really cuts through. Volume and Fuzz. There is also an internal trim pot for the transistor bias. There is no “incorrect” setting for this trim pot – only what does or does not sound good to YOU. The Monsterpiece Italian Stallion can be powered with 9 volt battery or 9 to 9.6 volt center negative barrel plug dc adapter (no daisy chain powering).